Russia and EADS continue fight for Indian aerial tanker. Russia's Il-78 Midas and the EU's Airbus A330 MRTT are the only competitors in a re-tender to supply six aerial tankers to the Indian air force (IAF), the India Strategic defense magazine said. The Indian government cancelled the initial tender, won by the European Aeronautic Defense and Space Company (EADS) at the beginning of 2010, saying the A330 MRTT aircraft was too expensive. The IAF announced a new tender in September 2010. Russia's United Aircraft Corporation (UAC) and EADS entered the tender with the planes they put forward for the first tender. U.S. aircraft maker Boeing considered its new-generation 767 model as a possible contestant, but missed the January 12 deadline to submit its bid. The U.S. aircraft maker cited uncertainty with the U.S. Air Force's order for 179 aerial tankers as a reason for not entering the competition for the Indian order, which is estimated at $2 billion. 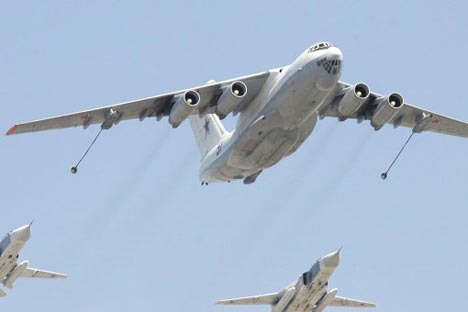 The IAF has been successfully operating a fleet of six Russian Il-78 aerial tankers since 2003. However, India says it is not satisfied with the level of after-sales service provided by Russia and has faced problems with supplies of spare parts and steep maintenance costs. The A330 MRTT (Multi Role Tanker Transporter) is manufactured by EADS on the basis of the Airbus A330 passenger airliner. The first A330 MRTT could be delivered to the IAF within three years of signing the deal, with the remaining five to be supplied up to 15 months later, the company said in its proposal.